The late Edward and Pauline Terry Buie opened Buie's Funeral Home in 1938. It was Hoke County's first black-owned funeral home establishment. During the 1930's and 1940's, Ed and Pauline conducted many funerals in the homes of the families of the deceased; later to add a family, modern chapel, preparatory, lounge and office rooms to the original building. In 1955, Mr. Ed Buie passed away and his wife continued to manage the business. Her son, Mr. Tony Buie returned from New York to help her in the operation of the business. Mr. Roosevelt Hockaday, II and Mr. James E. Jones were employed as licensed Funeral Directors. In 1998, Mrs. Buie passed away and her legacy has been carried on by her son, Mr. Elvis Buie and Mrs. Gloria Buie. They have done a fantastic job remodeling the funeral home to its present wonderful condition and named the remodeled chapel after Mr. and Mrs. Ed Buie in their honor. Under the new direction of Gloria and Elvis -- with continuing support of their family, employees, and friends, Buie's Funeral Home has survived for five generations and will continue to serve Hoke County and the surrounding counties with the utmost professional services and dignity. 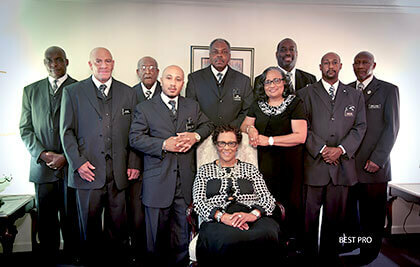 The caring and experienced professionals at Buie's Funeral Home are here to support you through this difficult time. We offer a range of personalized services to suit your family’s wishes and requirements. You can count on us to help you plan a personal, lasting tribute to your loved one. And we’ll carefully guide you through the many decisions that must be made during this challenging time.